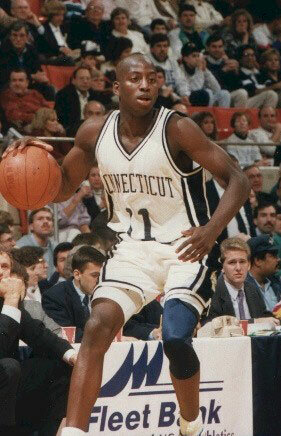 Oliver Macklin was a Guard for the UConn Huskies from 1989 – 1993. In September 2004 I had the opportunity to meet Oliver where he reflected on his childhood as an athlete, his basketball memories, and his current career path. As a child Oliver enjoyed playing football more than basketball, but there wasn’t a football league in Bridgeport, CT. Being the fourth of seven children, his parents weren’t able to regularly drive him to Stratford, CT to be in their Midget Football League so Oliver became interested in basketball. He played in the same neighborhood, and on a team at the local Cardinal Shehan Center alongside former UConn teammate Chris Smith. Oliver also played on a travel basketball team during junior high, and met players that he went on to play against during his college career, and some have played in Europe with former UConn teammate Rod Sellers. When Oliver reached high school the basketball team’s record from the year before was 1 win and 19 losses. His freshman year he was on the varsity team, but didn’t play a lot, and their record was 3 wins and 19 losses. As a sophomore he was a starter, and the record changed to 15 wins and 8 losses, as a junior 17 wins 8 losses, and progressively better as a senior, and captain of the team, 24 wins and 2 losses, loosing in the semi finals of the State Championship to a team they had beaten by 20 points during the regular season. Oliver remembered his high school days being a lot of fun when all the guys went to the barber shop on Friday afternoons prior to games, “Coach used to say ‘you look good, you feel good, and you play good’”. The barber would stir things up among the guys about who was going to do what on the court. Then the barber would bring up their previous week’s performance for conversation. Some accomplishments that Oliver is proud of as a youngster were going to Five Star Basketball Camp during high school. It was a camp with about 500 kids where they played basketball, and practiced drills all day, every day, for a week. He was also listed as an Honorable Mention All American in the Street and Smith All American Book, a member of the All Daily News Team, and was an All State Player. Oliver also did well in high school academically—he was a high honor student, senior class president, and a member of the National Honor Society. When Oliver got to UConn it was a big change from high school because Oliver said in college you are dealing with grown, strong, physical men. The Big East was literally the Big East. 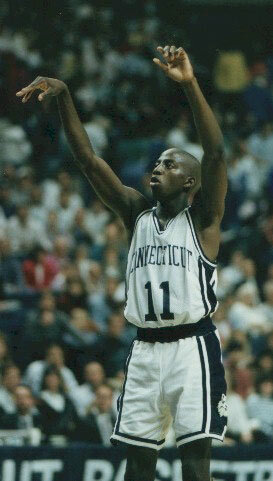 Some memorable experiences while at UConn were being co-captain of the team with Scott Burrell their senior year, being a part of the first Big East Championship Team was great, the year of the “dream season” too. “That was a great team. A bunch of hard working, blue collar guys.” That year CT basketball was put on the map, and began going to the NCAA Tournament regularly. The University of CT started getting nationally known players to come to UConn, and when Oliver was a junior, the freshman class consisted of eight players from states across the country. Oliver is also proud to have been an influence on one of the greatest legends to come to the University of CT, Ray Allen. When Ray came for his recruiting visit, Scott Burrell and Oliver showed him around and recently Ray told Oliver that the comradery with the UConn team and the closeness is what made him come to CT. He liked that the guys spent time with each other on the court, and off the court. Being so far from home he wanted to be with a group of guys who enjoyed being together. After graduating from UConn in four years with a Bachelors Degree in Communications, Oliver attended a few basketball camps and overseas tryouts, but the money wasn’t enough to keep him away from beginning a career in CT’s Judicial System. Oliver started out as a Bell Commissioner (like a mediator) for two years, then was a Probation Officer for seven years, and for the past two years he’s been a Probation Officer Supervisor, and after work he’s an assistant basketball coach at Stratford High School.